KATHMANDU: A 72-year-old man from a remote valley in southwestern Nepal was preparing Sunday to be measured by Guinness World Records experts investigating his claim to be the shortest man ever recorded. Chandra Bahadur Dangi, who claims to stand just 56 centimetres (22 inches) tall, was in high spirits as he looked forward to a third and final measurement. "They have already measured me twice yesterday. They didn't tell me what height they recorded but everyone is sure of my height and I'm confident I'm going to get the record," Dangi told AFP through an interpreter. If his height is verified, Dangi will take the world's shortest man title from Filipino Junrey Balawing, who measures 59.93 cm. He will also be declared the shortest human adult ever documented, taking the accolade from India's Gul Mohammed, who was measured at 57 cm before he died in 1997 aged 40. Dangi, who weighs 12 kilogrammes (26.5 pounds), was brought to the attention of the world three weeks ago after Nepali researchers looking into the history of the Dangi people were introduced to him. The pensioner, who earns a living weaving jute headbands, has only ever left his village in poverty-stricken Dang district 350 kilometres (220 miles) from Kathmandu a handful of times, and is in the Nepali capital for the first time. 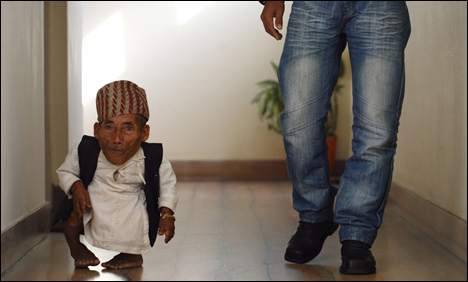 Magar's stint as the world's shortest man saw him travel to more than a dozen countries and make television appearances in Europe and the United States.